Heaven’s Best Carpet Cleaning Fargo ND and Heaven’s Best Moorhead MN offers carpet cleaning, rug cleaning, upholstery cleaning, and more! Our carpet cleaners give you the best value and we are confident that Heaven’s Best is the only carpet cleaning company you need. Call to talk to your local carpet cleaning technician to find out which cleaning service is best for you. They can answer your questions and schedule an appointment. We provide Carpet Cleaning, Upholstery Cleaning, Area Rug Cleaning, and Pet Urine Damage Treatment in Cass and Clay counties. Since 1983, we have been continually growing. There are currently OVER 2,500 CITIES where a Heaven’s Best operator can be found working. We also have multiple locations in Canada and England. Also, Heaven’s Best has won ‘BEST FRANCHISE OF THE YEAR’ AWARD 5 TIMES IN A ROW! Jamie Narum has been a loyal resident of the Cass-Clay area his entire life with no intention of leaving the best place to raise a family. Jamie worked in the carpet cleaning business during his college years and knew a great opportunity was in store with the Heaven’s Best Carpet Cleaning process. As a veteran entrepreneur, the family/ pet-friendly products and quick dry time drew Jamie to train with the best focus on superior customer service. With several years of carpet cleaning under his belt and a process that leaves carpets clean and smelling fresh, Jamie Narum and his crew are the hard-working carpet-cleaning technicians to get the job done! 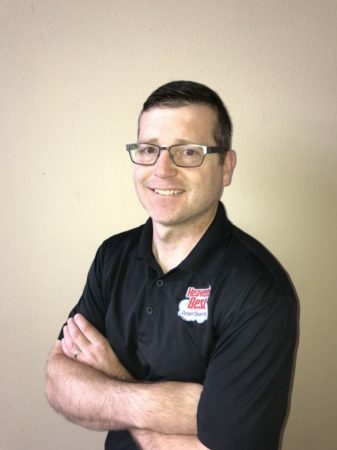 In his spare time, Jamie enjoys restoring classic and modern automobiles, coaching middle school basketball, and spending quality time with his family at the lake. Heaven’s Best Carpet Cleaning Fargo ND and Heaven’s Best Carpet Cleaning Moorhead MN provides high-quality services such as carpet cleaning, upholstery cleaning, rug cleaning, and many others. We don’t cut corners, we pay close attention to them. We strive for customers satisfaction. If the spot you asked us to clean comes back, so will we. It is our belief that people deserve a professional carpet cleaning company who they can trust to get the job done right. Our team at Heaven’s Best have been professionally trained in the art of floor and upholstery cleaning. At Heaven’s Best Carpet Cleaning Fargo ND and Heaven’s Best Carpet Cleaning Moorhead MN we understand you want to keep your home clean but live busy lives. Luckily, we have a carpet cleaning process that has your carpets dry in one hour. This allows you to get back to your busy life and keep a nice clean carpet. We have perfected the carpet cleaning process through years of trial and area. Great work and great service, we will have you come again. Left house so neat. Pleasant. Thanks! What a wonderful job Don and Jason did! I am thrilled! Thank you! Heaven's Best has been cleaning our carpets years and we would have no one else clean them!